Please refer to our stock # 008 when inquiring. 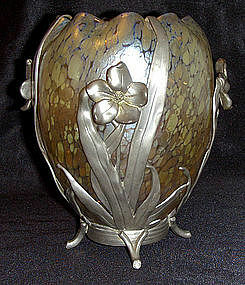 Beautiful Loetz vase with gold and pale blue oil spots, sits in footed pewter base with art nouveau flowers going around it. Measures 7" tall x 5" wide and is in perfect condition.